Our Ford dealership has a great selection of new 2016 Ford Mustangs for sale in the San Francisco Bay Area. The Ford Mustang has always been a driver’s car and this new model is no exception. 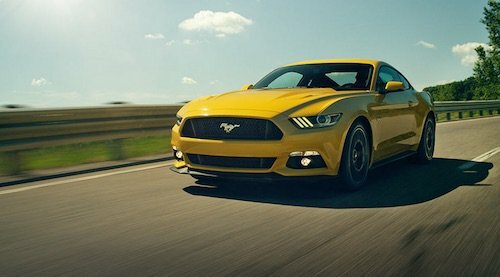 The Mustang is built to deliver the best driving dynamics, handling and control of any car in its class. Independent rear suspension and double ball joint front suspension provide excellent driving dynamics no matter what road conditions lie ahead. The new Mustang is equipped with selectable driving modes including Normal, Snow/Wet, Sport and Track. It also has Ford’s launch control which integrates the brakes, traction control and powertrain control to ensure smooth consistent starts for all driving conditions. This powerful muscle car is available with a choice of high performance engines. Mustang V6 Fastback models are equipped with a 3.7L V6 engine that delivers 300 hp. Ecoboost and Premium models are powered by a 310 hp, 2.3L EcoBoost engine. All GT and GT Premium models have a 5.0L V8 engine that delivers 435 hp. If that’s not enough power for you, the Shelby GT350 has a 5.2L V8 engine that cranks out a remarkable 526 horsepower. Exterior styling for the new 2016 Ford Mustang maintains the signature lines and curves. The sporty interior is beyond comfortable with bucket seats, ample legroom and a leather trimmed steering wheel. We invite you to come see the latest edition of America’s original Pony car. Our 2016 Ford Mustangs near San Francisco, CA are just waiting for a test drive.